Born in Illinois on August 16, 1941, John “Dave” Foehringer, 77, entered into rest on February 3, 2019. He is survived by his loving family; wife of 52 years Nora Foehringer, children; Maryann Foehringer Tolbert and David Foehringer (Dawn), sister; Donna Wolf, sister-in-laws and brother- in-laws; Shelia Gale, Patricia Roux, Dennis Duff, Cara and Cliff Swartz. In addition, Dave was blessed by six grandchildren; Davey, Elizabeth, Jacob, Ryne, Bryce and Nolan as well as many nieces, nephews and extended family members who loved him dearly. A native of Illinois Dave proudly served his county through the United States Army. Dave moved to California in 1962 where he met his wife Nora, and married in 1966. He worked for Libby Owns Ford for twenty-plus years and made a career change working Sharps Army Depot and finally retired at Tracy Defense Depot after thirty years of service. He was a fifty-seven year member of St. Anthony’s Catholic Church. Dave was a generous man with a cutting sense of humor. He enjoyed the little things in life; eating ice cream with the grandchildren and watching Fox news. 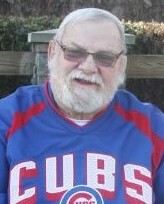 He was an avid fan of the Chicago Cubs, Bears and the Blackhawks. Dave’s grandchildren were the apple of his eye; he absolutely loved going to all of their MHS sporting events and Byer High events; he was their biggest fan as he always gleamed with pride. Above all Dave’s most lasting legacy will remain that of a family man; he was truly dedicated to his wife, children and grandchildren; he loved them unconditionally.